Tucker Carlson melts down faster than a polar ice cap in climate change debate with Bill Nye. Tucker Carlson got into a heated (pun intended) debate with Bill Nye the Science Guy during their discussion on climate change on Fox News last night. 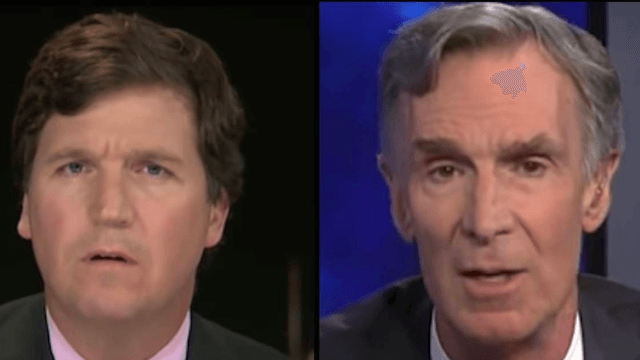 Basically, Nye argued that there is enough hard facts to prove that climate change is real and is speeding up due to human activity, while Carlson debated that climate change is not "settled science" and it's just some conspiracy theory the left made up when they were bored one day (or something). Although the entire debate is pretty uncomfortable, the real mud-slinging starts at 7:35. "You’re using the science of politics," Carlson accused. "You’re not a scientist, as you know, you’re a popularizer!" Nye timed how long it would take for Carlson to interrupt him. It was about 6 seconds. "So much of this you don’t know. You pretend you know, but you don’t know" said Carlson, clearly losing his footing in the argument and resulting to pettiness. "I’m open-minded and you are not," concluded Carlson, the same man who argued that Moonlight only won the Oscar of Best Picture because of political correctness. Let's just hope we are not all under water by the time this debate is finally settled.